Sydney has a new public transport ticketing system. It is touted as being much better than the previous system but one unfortunate consequence was that the multi-journey tickets under the old system were given a sunset date: 30 June 2010. This is of no consequence to frequent bus travellers who quickly get through multi-journey tickets but I suspect many bus travellers are like me: I don’t catch buses very often so my ‘Travel-10’ lasts me for many months. To use up my ticket I decided to have some lunchtime escapades by taking a bus into the CBD from where I work at Haymarket. On my travels I visited two pieces of interesting and related First World War military history. 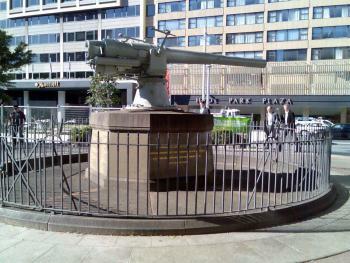 Walking back through Hyde Park I stopped at the gun taken from the wreck of the German cruiser SMS Emden. On another day I took a bus from Wynyard over the Harbour Bridge to Milson’s Point so I could see the bow of HMAS Sydney which is set into the sea-wall, underneath and just to the east of the bridge. Prior to the First World War Germany held a colony at Jiaozhou Bay on the east coast of China. Germany maintained this outpost for reasons of trade but also to provide a strategic presence for its navy in the Pacific. The city of Tsingtao was the administrative centre of the colony and also home to the German naval base. The SMS Emden was built in Danzig and launched in May 1908. It displaced 3,364 tonnes, was 118 m long, had a top speed of 43 km/h and was armed with ten 105 mm guns.The Emden was assigned to the German East Asia Squadron, commanded by Vice Admiral Maximilian Graf von Spee, and stationed at Tsingtao. In May 1913 Captain Karl von Müller took command of the Emden. In August 1913 the Emden took part in a joint action with British, US and Japanese warships against an uprising of Chinese rebels along the Yangtze River. During 1914 a war in Europe seemed increasingly likely. The day before war was declared, the 31st July, von Müller left Tsingtao, fearful that the Emden might be trapped by an allied fleet. On August 13 the squadron met at Pagan Island in the northern Marianas where it was agreed that the Emden would sail to the Indian Ocean to harry British and Dominion merchant shipping while the rest of the squadron would attempt to return to Germany via the Pacific and Cape Horn. Winston Churchill wrote that Graf Spee and the German East Asia Squadron would be doomed once war was declared: “a cut flower in a vase, fair to see yet bound to die.” The squadron was made up of ships mostly inferior to the latest British cruisers and coal and other supplies in the Pacific and Indian oceans were in the hands of the Allies. Spee made his way through the South Pacific, coaling at Easter Island, until he met the British South Atlantic Squadron, under Rear-Admiral Sir Christopher Cradock, off the coast of Chile. On the 1st November the ‘Battle of Coronel’ resulted in the sinking of two British armoured cruisers. There were no survivors from the combined crew of 1600, which included Cradock. While the British Admiralty saw this as a disastrous defeat Spee knew that this was the beginning of the end for his squadron: he had used more than half his ammunition and had no way to re-arm. Spee received a hero’s welcome from the German inhabitants of Valparaiso then moved the squadron to Mas Afuera some 600 km off the coast. Spee decided to round Cape Horn and attack Port Stanley in the Falkland Islands but the British Admiralty by then had had time to greatly reinforce the South Atlantic and so, on the 8th December, the German East Asia Squadron was destroyed by a superior force. 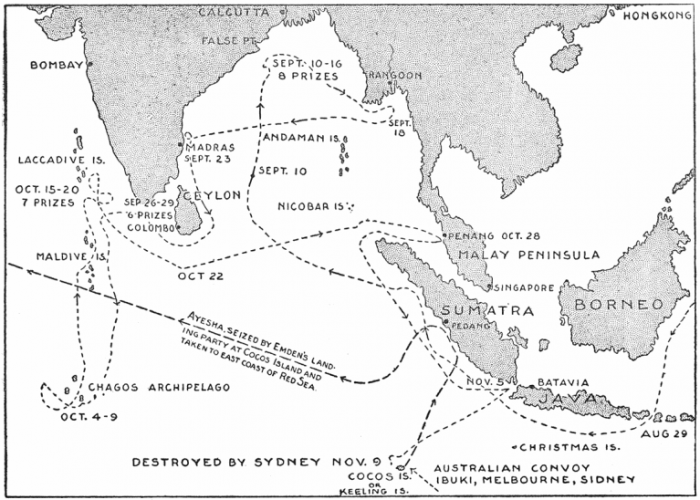 Meanwhile the Emden had been disrupting shipping in the Indian Ocean – sinking or seizing more than 20 Allied ships. After leaving Pagan Island von Müller spent most of the rest of August preparing for his mission. The Emden had already been mistaken once by the Dutch for an English cruiser so to complete the charade a dummy fourth funnel was erected. From a distance the Emden now looked quite like the HMS Yarmouth which was hunting for the Emden. On 28 August the Emden slipped through the narrow strait between Bali and Lombok into the Indian Ocean, her collier Markomannia several miles astern. Captain von Müller saw himself as a gentleman officer which meant that his goal was the destruction of allied assets but wherever possible he rescued sailors. Typically he would fire over the bows of his victims, remove the crew, scuttle the ship, then transfer the crew to some other vessel for subsequent release. During September von Müller captured 17 ships. This had the intended effect of shutting down the Indian Ocean trade route. The British Admiralty closed the Colombo-Singapore route and for commercial shipping very high insurance premiums made trade uneconomical. In response warships from the British, Australian, French, Japanese and Russian navies attempted to hunt down the Emden. The Emden steamed south to the waters around Ceylon then on to Chagos Archipelago and the Maldives, capturing many more ships over a 3 week period, including the collier Buresk with a load of Welsh coal. During this period von Müller learned from the captain of one of the captured ships that the Malayan port of Panang was being used by allied warships. He and his crew also knew that it was only a matter of time before the Emden was hunted down so it was important to keep moving and to attempt more ambitious targets while still able to. On the 28th October the Emden entered Panang harbour and sank a Russian cruiser: the Zhemchug. Then just outside the harbour it engaged and sank the French destroyer Mousquet. The next major target was the wireless station and telegraph cable on the Cocos (Keeling) Islands. Von Müller had previously arranged for a captured collier, the Exford, to meet the Emden near these remote islands. The plan was to destroy the communications facilities then carry out coaling and some much-needed maintenance. The name ‘Cocos (Keeling) Islands’ is used to differentiate them from the Cocos Islands in the Bay of Bengal. William Keeling of the East India Company discovered the islands in 1609. The Emden anchored off Direction Island, the northernmost of the Cocos group, at 6am on November 9. A landing party of 50 was sent ashore to destroy the radio tower and equipment. This was done but not before a message had been sent that an enemy cruiser had been sighted, possibly the Emden. Von Müller was not to know that an Allied convoy was barely 50 miles away. This was the first convoy transporting Australian troops from Fremantle to Colombo, on their way to Egypt and the trenches of the Western Front. 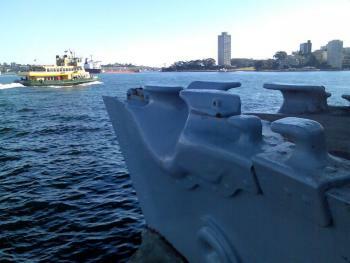 HMAS Sydney left the convoy and steamed south. At 9am the Emden’s lookout reported a ship approaching from the north. Initially they thought it was their collier, the Buresk, but soon realised it was an Allied cruiser. The Emden blew its whistle to order the landing party to return as quickly as possible but it was too late. The Emden weighed anchor immediately and steamed north to meet the Sydney which had bigger guns, heavier armour and greater speed. Von Müller knew his only chance of victory was get within range with his 105 mm guns, knock out some of the Sydney’s 6 in. guns, then get close enough to use torpedoes. 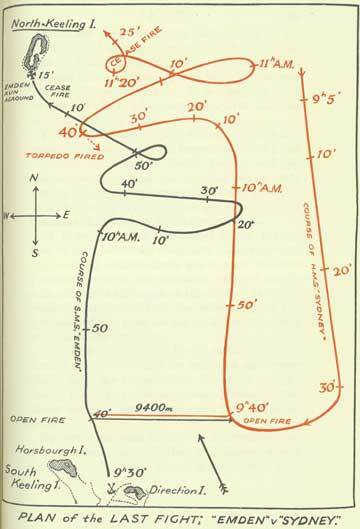 At 9.40am the Emden opened fire and had early success. It destroyed the Sydney’s rangefinder during the first salvo which prevented the Sydney from making direct hits for some time. But the superior speed of the Sydney allowed it to stay at a distance that was on the limit of the Emden’s range while its own guns found their range through trial and error. Once the Sydney’s gunners found their range the Emden was pounded to destruction. Von Müller ran the Emden aground on a reef just off North Keeling Island to give his crew a chance to get to shore. The German landing party left behind on Direction Island had witnessed the early phase of the battle and realised that whatever the outcome they were on their own. Rather than wait for the Sydney (or some other Allied ship) to return they commandeered an old schooner, the 97 ton Ayesha, spent the rest of the day repairing and loading, then sailed north towards Sumatra. The Ayesha was owned by the Clunies Ross family but it had not been used for some years and was suffering from dry rot. Despite it being barely sea-worthy the party, under Lieutenant Captain Hellmuth von Mücke, decided that taking a chance on the open seas was preferable to waiting on Direction Island to be captured. What followed was one of the greatest adventures in naval history. [The Australian War Memorial website provides access to a collection of photos, gathered from various sources, which show the events on the Cocos (Keeling) Islands. Here is a photo of the German landing party leaving Direction Island with the Ayesha in the background]. Von Mücke’s timing was perfect. The Ayesha must have passed closely to the Sydney that evening because the cruiser had returned to Direction Island but did not have sufficient day-light to enter the harbour. Von Mücke and his crew had an uncomfortable three week journey to Sumatra. The Ayesha was designed for a crew of 5 not 50. Perhaps it was fortunate the boat leaked the whole time as it gave the crew something to do. Food and drinking water were in short supply. Fortune was also on their side when they sailed into the Samatran port of Padang on the 26th October. The neutral Dutch authorities said that a Japanese ship which had been cruising up and down the coast on the lookout for them had gone off to coal just a few hours before their arrival. The Dutch wanted to intern this band of itinerate combatants but von Mücke convinced them that the Ayesha was a German warship and that they should be allowed to provision and be on their way. 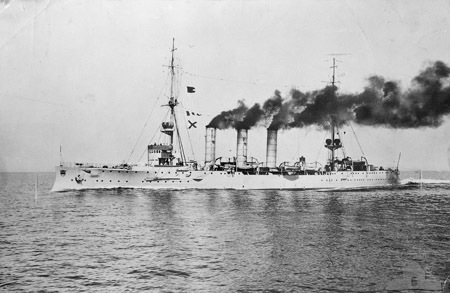 During von Mücke’s 24 hours at Padang he met with the German Consul who arranged for the procurement of a German-owned merchant steamer and briefed him on events since the outbreak of war – importantly that Turkey was an ally of Germany and that it controlled much of the Arabian peninsula. So a return to Germany via Arabia and Turkey was considered a possibility. Von Mücke and his crew sailed back out to sea on the Ayesha to wait for the promised vessel. On December 14 von Mücke and his crew met the Choising. It was more spacious than the Ayesha but it was hardly more sea-worthy and, being a Chinese coastal steamer, had no maps of the Indian ocean. Nevertheless they successfully crossed the Indian Ocean in it, evaded the British blockade at the entrance to the Red Sea, and landed at Turkish controlled Yemen on January 8, 1915. Crossing the Indian Ocean aboard the Choising may have been a challenge but for these sailors the prospect of an overland march of many thousands of kilometres must have had them reminiscing about their days on the Ayesha. For 5 months Von Mücke and his men travelled by camel and foot, dodged French and British patrols in the Red Sea, negotiated safe passage through Turkish controlled areas and fought a pitched battle with 500 Bedouin tribesman who were part of Lawrence of Arabia’s irregular forces. On 7 May they reached the rail head at Al Ula where the German government had organised a train to take them to Constantinople. “In Northern Arabia we had to take to the land once more and so without further incident we reached the southern end of the Syrian railway, where we exchanged our camel saddles for railway carriage cushions. A few weeks later we delivered the flag of the “Emden” to our German Naval Authorities in Constantinople. So, in June 1915, among the roses of Constantinople, ended our journey which had begun in November 1914 under the palms of the Cocos Islands in the Far East”. The survivors from the wrecked Emden, including Captain von Müller, were collected by the HMAS Sydney and taken to Colombo. Conditions were cramped onboard so some were transferred to the SS Empress of Russia during the journey. 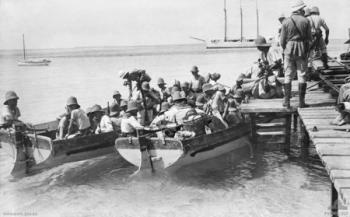 At Colombo 50 wounded POWs were landed ashore for hospital treatment while the others were transferred to 3 transport ships which were part of the first ANZAC convoy to Egypt. The wounded POWs were eventually shipped back to Rottnest Island and then interned at Holsworthy and Berrima near Sydney. After landing in Alexandria von Müller and the others were transported to a POW camp on the island of Malta. Lochner, R.K. 1988, The last gentleman-of-war : the raider exploits of the cruiser Emden, trans Thea and Harry Lindauer, Naval Institute Press, Annapolis, Md. Writer, L. 2009, First blood : Australia’s first great sea battle, Media 21, Double Bay, N.S.W. The Emden’s Last Fight. [By the Cable Operator at Cocos Islands.] The New York Times Current History of the European War, Vol 1, Issue 4, January 23, 1915, p.758 [This is available online but I always seem to have trouble locating so I have kept a copy. This entry was posted in History on July 6, 2010 by Steven. I really enjoy putting my feet up and watching some guys digging in a soggy trench and going ooh-aah when they find a bit of old pottery or lump of rust. 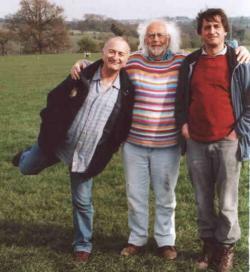 Time Team has been a favourite for a long time. Baldrick from Blackadder (aka Tony Robinson) is the host but he has a bunch of side-kicks. 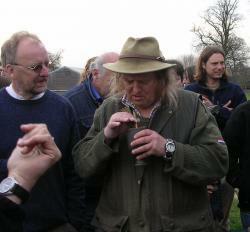 These include a guy who looks and sounds like Catweazle, and another with a west country drawl and funny hat. Not to be confused with Tony Robinson talking about the Worst Jobs in History. More recently I’ve begun watching Two Men in a Trench. 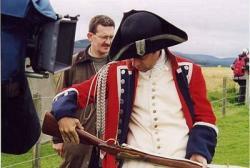 The two men, Neil Oliver and Tony Pollard, investigate battlefield archeology and like to dress up in period gear. They also have a team of diggers and experts. A notable expert is Andy Robertshaw who runs the Royal Logistic Corps Museum (standing behind the Red Coat). 10 December 2009: I’m also enjoying ‘A History of Scotland’ on SBS at the moment. So far the first episode of five has been screened. It covered the early history: the Roman invasion of northern Britain and their withdrawal as far south as Hadrian’s Wall, the conflict between Picts and Gaels and the establishment of the Kingdom of Alba. 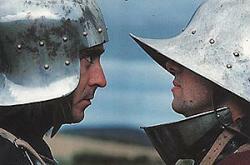 21 December 2009: Robert the Bruce, King Robert I of the Scots (1274-1329), versus King Edward I (1239-1307) of England. What a bloody mess. 6 January 2010: I missed episode 4 (the rise of the Stewart royal family and the creation of the highland/lowland divide) but saw the finale, episode 5. Neil seemed to have calmed down. Maybe he knew that the series was coming to an end, as was Scotland as an autonomous kingdom. This entry was posted in History on November 6, 2009 by Steven.